Let’s walk away from the financial situation John Carter has gotten itself into and the extraneous events (saved for another blog or better served by other articles). 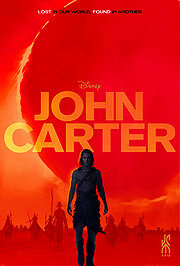 Instead, as always with many of my reviews, let’s focus on whether or not John Carter itself was a well-executed and unique film (and to additionally note, I am not very familiar with the original source material). Indeed, the film comes out in a unique position – a story that was created at the start of the 20th Century and creating numerous inspired films and stories after it, but a film coming much, much later in a fairly crowded genre. This is important to note because to understand the context is to comprehend some of the frustrations and hopes the film brings forward. Ultimately, John Carter is a good film that has a lot of charm and really tries it’s best to hit all the marks of a sci-fi film. However, it’s that very check list-like motivation that drives the film down with strange structural decisions and a case of quantity versus quality. John Carter (Taylor Kitsch) is the titular character, a former captain of the Civil War who has lived a tough life on his own. One day, he is forced to escape to a cave and finds a strange man transported next to him. Forced to kill him, Carter takes an amulet and is suddenly transported to a strange world where he learns he can jump high in the air and is given strength. Soon, however, he is captured by an alien race and after an altercation, runs into Princess Dejah (Lynn Collis) and informs Carter of an impending war. John is forced to make a choice between his morals and whether to fight or to find a way home. The film’s biggest strengths lie in it’s quirky charm and strong sense of theme and atmosphere. Stanton’s Pixar background serves him well in exuding charm into any situation and create unique situations which are definitely in John Carter and are some of it’s best parts. When John Carter takes his first step on the new planet, the situation seems so quirky, but the action, direction and music all combine into a scene that is memorable and fascinating. Adding to this is a relatively good pace, at least in the middle of the film along with a unique look that eventually grows on the audience. The action is moving with quick story and action beats, helped much by the many different situations that Stanton and his team create, and the general look of Mars and it’s inhabitants seem a bit strange at first but eventually does pull you in. Hats should go off to the art design team and the CG work that has some truly beautiful moments that are wonderful. Finally, there is a definite thoughtfulness to the entire narrative arch and it’s symbolism. The script oozes with parallelism in the story beats while the world is given a lot of life about different origins, cultures and several strong themes running concurrently. There is little to deny that the world of John Carter lacks any depth and has the recipe for a rich world filled with lots of fascinating wonders and a smart sense of how to engage the audience with different narrative techniques. However, the ultimate end film never goes beyond it’s requisite checklist for success as it falls victim to what seems to be an over ambitious film. The core problem comes because there is a significant sense of quantity versus quality. The film attempts to accomplish a host of plot points, symbolic gestures and epic action moments and eventually ends up clashing or falling flat to the stronger moments of the film. Moments that were set up to be revelatory or just cool to watch end up being silly. For instance, a potentially epic moment has John Carter fighting off hundreds and hundreds of Thonks by himself in a John Woo-esque moment that cuts out much of the sound and pins the camera around Carter yet ends up as a silly moment that seems out-of-place in the film. Even the narrative starts to suffer from plot holes that become more and more noticeable such as why the Thonks, the strange creatures of the planet, are present in a scene by the cliff. Structure is also a problem, ending up as another unnecessary element that hinders the film with mysterious elements or complexities that don’t end up panning into anything satisfying. An example can be pointed at the film’s beginning and ending that, again, tries to satisfy the audience with a particularly strange moment that does end up getting answered but supplies an ‘answer’ so readily apparent and doesn’t fit with the rest of the film. Finally, the audience never completely emotionally engages with the characters here. The character’s complexity never goes further than perhaps two basic levels (for John Carter – a rebel versus a man who was in love) and although the charm is apparent; is only apparent in the actions rather than the characters. Perhaps some might say that it isn’t an issue since the film is staying simplistic but in turn, the plot’s direction makes little sense such as with scenes near the end that never feels legitimate. Again, it feels like there was just too much that overwhelmed the creative team that didn’t create a more flowing and connecting narrative. John Carter is an okay start at an epic sci-fi film that hits all the requisite marks but is too concerned with the check-list of plot beats than carving out its own identity. Not to say that the film isn’t without it’s own bit of charm, Carter develops some interesting and quirkier moments that draws the audience in along with the mystery and intrigue of epic sci-fi fights and learning all the sci-fi cultures. However, the end product fails to expand on it’s unique points with an unnecessary narrative structure, a lack of character, and a plot that sprawls a period that seems too ambitious for it’s own team. The Hunger Games: A Faithful Adaptation But For Everyone? I always empathize for the director and screenwriter of book-to-film adaptations. Whether the book is merely a few pages long or a few hundred pages, the creative team must fit in what could be minutes or hours worth of material into a one to three hour time span and either evoke a very faithful or very provocative transformation. Even more importantly, the film must still be a great movie at its core. The Hunger Games is the first in a popular book trilogy and falls under the same questions – does it succeed? In the end, fans of the book should be fairly pleased with the faithful adaptation while fresh audience members, while most likely overwhelmed by the amount of information they must encapsulate along with a lack of complete emotional empathy, should be at least interested in the fascinating themes and imagery the subject matter has to offer. 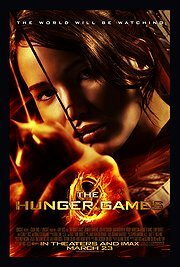 The Hunger Games follows 16-year-old Katniss Everdeen (Jennifer Lawrence), who lives in District 12. Each year, the 12 Districts must give a tribute of a boy and a girl to fight in the annual Hunger Games on live television until there is a victor. When the time comes for the year’s reaping ceremony, Katniss’ sister, Primrose Everdeen (Willow Shields), is chosen. To save her sister, Katniss volunteers and is paired with Peeta (Josh Hutcherson). Together, they travel to the Capitol with Effie (Elizabeth Banks) and Haymitch (Woody Harrelson), their mentor, to be showcased and trained before they must enter and attempt to survive the year’s Hunger Game. The weakest sections of The Hunger Games come from a lack of emotional connection and amount of information being thrown into audiences. The main issue that I think most non-Hunger Games audience members will have is the lack of a complete emotional resonance. There are some definite emotional highlights but it becomes more rare to see the film take more time and care with characteristics and backgrounds. The result is a story that doesn’t properly draw you into moments such as the film not properly explaining or expanding on the relationship between Katniss and other tributes. Whether it’s weaker acting from some of the periphery characters or a plot that glosses over the information fairly quickly – this problem becomes much more of a frequent problem. The general flow of information as well becomes an issue unto itself, especially for people that haven’t read the books. Expect some confusion as the film tries to delicately balance an overload of information and a pacing that sometimes glosses over some finer points, creating some strange dialogue trees. A conversation about a blown up arsenal, for instance, comes up even though the established dialogue was never set up previously. Take note Hunger Games newcomers – even with a fairly long running time, the film doesn’t linger on its exposition. Otherwise, however, The Hunger Games is a fascinating aesthetic and thematic journey that should be of interest to most audience members. Director Ross and crew take a lot of pride in choosing and sticking with their visual choices, for instance, which defines the film. From the color correction to the documentary-style cinematography to the extreme costume design differences, there’s as much of a 1984 inspiration as well as something more from a period piece like Seabiscuit. Clean white police uniforms with a strange futuristic twist clash brilliantly with the downtrodden, early 20th-century look of the denizens of District 12. These consistent choices help to sell an authentic world, especially as the games begin. These aesthetics also fall into some great acting, especially from Hutcherson and Lawrence who put on a heartfelt performance, even when the script may not make the most sense or feel contrived. Lawrence, especially, is captivating as a stalwart teenager dealing with the life-and-death scenarios put before her. These scenarios are also the fascinating reasons why, I believe, both fans and non-fans will find some interest in the core film. The script and the narrative arch do little to deviate from the intended book’s arch, which, although may be convoluted at times or may not always result in a perfect cinematic moment – the themes are still interesting to explore and touched upon and creating a situation that should appease people that have read the source material and still fairly coherent enough for newcomers with some added exposition. An added emphasis on the Gamemaker, for instance, helps emphasize the reality show nature of the film without feeling too unnecessary. The Hunger Games concept may not be completely unique unto itself and may not completely resonate with non-readers, but the film itself is both a faithful adaptation and a pretty fascinating journey from start to finish. Audience members who haven’t read the book will feel a bit overwhelmed by the material and characters that sometimes quickly come and go, not helped by minor plot holes and an emotional core that doesn’t always resonate. However, fans of the book should be fairly pleased with the final outcome of a very faithful adaptation along with some interesting additions, and non-fans should be fairly intrigued by the dystopian future created by Ross and his team along with the great casting. All-in-all, The Hunger Games is a solid and timely film that evokes questions of our own media consumption in the present day. How do you create a superhero? There are some very simple parts that seem like they must always be available such as a main hero (or multiple) who have some flaws, a method in which to create the power, the discovery of those powers, and a villain that can challenge the hero. These are very constant themes and stereotypes that run through nearly all superhero stories from Superman to Spider-Man, albeit in their own unique variations. However, in the film world, it isn’t a constant presence to see someone tackle a unique hero that has not been created in some other medium. Indeed, Chronicle is an interesting look into first-time director’s Trank’s idea of a modern superhero that melds some more modern techniques with the tired-and-true and ends up with a film that, for all it’s smaller faults, makes for a compelling watch into a superhero film that worries about it’s stories and concepts first before it’s special effects and choreography. Chronicle follows three high school students – the reclusive and shy Andrew (Dane DeHaan), his cousin Matt (Alex Russell) and a well-liked Steve (Michael Jordan). The film starts out as a documentary of Andrew’s day-to-day life who finds some safety with his camera. However, at a late night party, Steve and Matt get Andrew to film them entering a strange hole and eventually, a power source that they all touch. The next thing they can remember after blacking out is waking up with the ability to move objects with their minds albeit with some caveats. However, their powers soon take them through an emotional journey about growing up and understanding the powers of responsibility. The film’s biggest missteps fall under it’s typecast characterizations, shallower moments and some weaker aesthetic visuals. 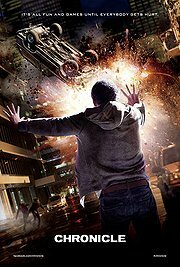 Chronicle sometimes falters under weaker ideas or moments that may not flourish as well as originally intended. One of these ideas is in it’s characterizations both in the characters and the tone. The film centers around the supposed present-day high school life and turns to the tried-and-true, such as the jocks, the ‘popular’ kids and the late-night parties which feels shallow and uninspired, even with the unique angle. The problem bleeds not only into the atmosphere but the main characters as well who feel necessary to fulfill their stereotypes rather than aim for more unique territory as the more ambitious story arch. The setting becomes even more jarring as the students tread into older territory scenarios that feels very unlike their high school locale. Additionally, some of the main characters just feel underdeveloped in general with a lack of much about their family, a major theme of the film, and more shades and undertones. The other side is simply on an aesthetic level, which the film fluctuates back-and-forth from something believable to something that wasn’t given enough time or a budget. A simple scene with the young protagonists testing out their powers with building blocks feel unnatural but another more complicated scene with a crushed car looks much better. That being said, Chronicle is solid with it’s original narrative and captivates the audience with a consistent style and presentation along with a great main character. The film is stalwart in making sure it’s style is rarely broken, which contributes a lot to the engagement and believability of it’s reality. The film, for instance, has no non-diagetic soundtrack and even all the diagetic music is simply party music at dances or the radio. The audience always knows where the camera is and uses the limited perspectives deliciously as part of it’s theme. And the main character, Andrew, is fairly well-developed as the camera dwells with him and the film is really carried by the way he grows and the powers he consumes. These points, unto themselves, have been done before yet in this unique configuration, Director Trank commands a fascinating look into crafting a modern superhero story without having to resort to a tried-and-true brand or mostly unnecessary elements. The mockumentary-light angle becomes one of thematic importance than just aesthetic trappings and by the film’s end, there is enough of an emotional resonance to have a connection with the characters. The consistency can also be carried over to one more important section of the film – the narrative flow. Chronicle really seems to enjoy slowly crafting and enjoy the evolution of the superhero-light characters and much different than perhaps a superhero film that feels burdened to rush through it’s origin story and get to the main conflict. Indeed, this journey that really feels plotted throughout the entire film is a good and engaging way to bring forth not only an original superhero film but a connective one as well. Chronicle isn’t an amazing reinvention of the superhero genre or the mockumentary angle that has been played up in the last few years; it’s a solid film that creates an original superhero adventure from the inception to end without having to utilize a franchise or completely be boggled down by complete contrivances. Ultimately, the film does suffer from it’s attempt to appeal mainly to the teenager demographic and creates some lacking characterizations of some characters like Steve (along with some problems with it’s CG at times). However, even with some shallow moments and silly thoughts about urban high school life, the consistency in it’s theme and presentation along with the earnest joy in it’s story makes Chronicle work whether it is the honest fun the characters have fooling around with their powers to the simple yet poignant case studies of these three different people getting powers. All-in-all, it’s a fascinating start to a heavy year of superhero films and a good one at that. Biopics are fascinating beasts because not only are they accounts of a person’s life but bring out interesting intentions of the filmmaker behind it. Does the filmmaker revile or praise the subject and is the approach a more fantastical or more grounded approach? Much different than a documentary, a biopic works best when it stands with a purpose and creates a much more fascinating final project. The Iron Lady actually starts out with a bold statement, that it would explore the life of Margaret Thatcher and her struggles in the latter part of her life made up of the events of her past. However, the approach feels ultimately misguided and haphazard as a messy plot and context creates more of a passing glance than an interesting whole story. The Iron Lady follows Margaret Thatcher (Meryl Streep) who lives at home as the former prime minister of Great Britain. Unfortunately, she also struggles with dementia, imagining her recently deceased husband, Denis (Jim Broadbent), to still be speaking to her, much to the chagrin of the family and staff around her. The film follows her day-to-day life trying to cope with her dementia while reminiscing on her younger career (played by Alexandra Roach) as an-and-coming politician in a heavily male-dominated political world and her ascension as prime minister. The film’s best parts lie in it’s acting and interesting premise and angle. Meryl Streep is always a joy to watch in each of her films as she really magically transforms and powerfully commands the role she plays. Here, Streep plays a multi-faceted Thatcher from her days in parliament to a dementia-stricken older grandmother. Although the range is impressive, the best moments come when Streep is in the lion’s den of Parliament and engages in debates with her fellow Parliament members. These scenes are perhaps the best in the film as well as the subject matter (and Parliament debates in general) are always entertaining and transfer well to film and showcasing the gender and institutional battles while allowing Streep to fully embody the character. The film itself is helped by a different approach to the typical biopic formula. Instead of starting simply from childhood to the present state of the biopic character or simply focusing on one section of the subject’s life, the film is more interested in her older years and her on-set of dementia with her deceased husband still haunting her. The film still showcases the childhood and middle years of Thatcher but not as important or emphasized as her latter years as an elderly woman. Unfortunately, this different biopic approach is proven to be weaker and misdirected by film’s end and additionally marred by strange aesthetic choices. The main problem seems to be centered around reinforcing why the film’s purpose is appropriate. As interesting as the perspective may be, the film is never convincing enough why it center around Thatcher’s latter years. Instead, The Iron Lady feels disconnected and haphazard as it tries to juggle this back-and-forth reasoning between the feelings Thatcher feels in her nightmares to a past incident. These elderly scenes feel inconsequential and unimportant and even more unfortunate, less well-acted and interesting than these earlier day scenes. Streep is at her best when given the firepower to crack against the heavily male-dominated Parliament, not her premonitions of her deceased husband and there just isn’t enough of her early life to make up for a heavier latter life crisis. The filming itself is also not up-to-par. Editing work, for instance, heavily relies on repetition but unfortunately, of the exact same scene and not too long after it’s been shown. Various filming angles and sound uses also feel underwhelming whether it’s due to a strange shot of Streep or an explosion that is oddly placed. Even the soundtrack feels misplaced, that tries to be timely or epic at times but ends up in a scene that doesn’t need either. All-in-all, the thought I had to myself was how it felt like a cheaper television film that wasn’t more careful and meticulous about it’s subject matter and felt more like a haphazard production that never came quite together in the end. The Iron Lady is, for the most part, a misdirected opportunity that may feature an interesting target and the great Meryl Streep but a messy and haphazard central plot. 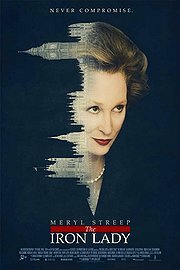 There is no denying that Streep continues her reign as one of the best actresses of the time with a wonderful interpretation of Thatcher that is enjoyable and flawed as well as nuanced along with a fairly unique take on the traditional biopic. However, the overall film is not convincing enough to prove that it’s perspective was worth the trip through some fairly ineffective editing and strange aesthetic choices. It’s an unfortunate case of having all the right pieces in place but not enough substance and bite to really make for a convincing overall film for the audience, Thatcher’s legacy or the crew and cast themselves.